Water Wars: President Obama visited California’s drought-hit Central Valley Friday, offering handouts and blaming global warming. But the state’s water shortage is due to the left’s refusal to deal with the state’s water needs. Following legislative action last month by Speaker John Boehner and California’s Central Valley Representatives David Valadao, Devin Nunes and Kevin McCarthy, whose Sacramento-San Joaquin Valley Emergency Water Delivery Act was designed to resolve the long-standing problem of environmental water cutbacks that have devastated America’s richest farmland, Obama is grandstanding in California, too. His aim, however, is not a long-term solution for California’s now-constant water shortages that have hit its $45 billion agricultural industry, but to preach about global warming. Instead of blaming the man-made political causes of California’s worst water shortage, he’s come with $2 billion in “relief” that’s nothing but a tired effort to divert attention from fellow Democrats’ dereliction of duty in using the state’s water infrastructure. The one thing that will mitigate droughts in California — a permanent feature of the state — is to restore the water flow from California’s water-heavy north to farmers in the central and south. That’s just what House Bill 3964, which passed by a 229-191 vote last week, does. But Obama’s plan is not to get that worthy bill through the Senate (where Democrats are holding it up) but to shovel pork to environmental activists and their victims, insultingly offering out-of-work farmers a “summer meal plan” in his package. “We are not interested in welfare; we want water,” Nunes told IBD this week. He and his fellow legislator Valadao are both farmers who represent the worst-hit regions of the Central Valley in Congress and can only look at the president’s approach with disbelief. “He’s not addressing the situation,” Valadao told us. 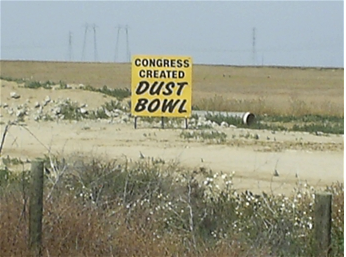 “They want to blame the drought for the lack of water, but they wasted water for the past five years,” said Nunes. The two explain that California’s system of aqueducts and storage tanks was designed long ago to take advantage of rain and mountain runoff from wet years and store it for use in dry years. But it’s now inactive — by design. “California’s forefathers built a system (of aqueducts and storage facilities) designed to withstand five years of drought,” said Nunes. “We have infrastructure dating from the 1960s for transporting water, but by the 1990s the policies had changed,” said Valadao. Environmental special interests managed to dismantle the system by diverting water meant for farms to pet projects, such as saving delta smelt, a baitfish. That move forced the flushing of 3 million acre-feet of water originally slated for the Central Valley into the ocean over the past five years. That hasn’t helped the smelt any. But that doesn’t seem to matter to Obama or his environmentalist friends. “We can’t make it rain, but what we can do is (conserve water) and save it for today, and we did not do that for two years,” said Valadao, citing a recent wet year. Nunes said the problem is serious and calls for concrete solutions, not dreamy social re-engineering efforts based on the unproven science of global warming. But that’s right where California finds itself now.